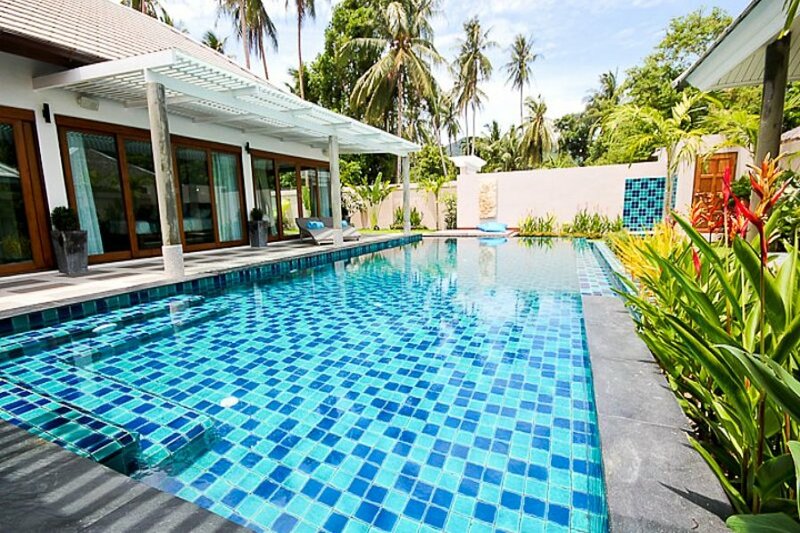 Modern, elegant pool villa designed for the comfort of the owner or guest alike. Located in a quiet area very close to the beach, small shops, wonderful massage spas and restaurants. The villa is finished to a high standard. The living room is modern and elegant. There is a full surround music and sound system with dual zones and indoor and outdoor speakers. There is wireless internet and a full satellite package. The kitchen is fully equipped with modern appliances and plenty of cutlery, crockery and glass ware. There is a double sink and drainer as well as an additional bar/vegetable sink in the breakfast bar. All work surfaces are a black galaxy marble. The dining set is a contemporary teak design, with a dramatic black chandelier above. A perfect setting should you wish to entertain. Each of the bedrooms has a deluxe ensuite bathroom as well as the guest toilet that is off of the living room. Bedroom 2 has two additional full sized guest beds that fit under the twin beds in the room. They are on wheels and can be moved to accommodate your families requirements. The garden is fully unclosed and is entered through the gate that leads off of its own private driveway and parking area. The tropical garden is a peaceful place to sit with views up the palm covered hills. The pool was designed with the owners children in mind. It has a chlorine free cleansing system, making is kinder to your skin and eyes. The pool is approx 1 meter in the shallow end sloping to 1.8 meters at the deep end with two wide steps to sit on and relax. The garden sala seats 6 people comfortably while the terrace and sun deck has a further 4 sun loungers and sun bathing pads. The villa is self catering, however a private chef can be arranged either to cook for you in the villa or deliver to you as per your order. Our cook can cater for European or Thai foods. This service is charged for separately. All linens and towels are provided including hotel style dressing gowns etc. The living area is elegantly furnished, open plan and has high vaulted ceilings to give an even greater feeling of space and serenity. There is a 55" 3D television with full surround and multi zone speaker system. Each of the spacious bedrooms is also equipped with led TVs and a play station for the children in bedroom 2. Ban Tai is a quiet little suburb bit it is only minutes away from Nathon, the main town of Koh Samui and Maenam, a characterful one time fishing village with its lovely Temple. The location makes Ban Tai Tara 3 ideal holiday destination for those seeking something a little more tranquil.